The one-hour TV show on the 2018 Great Race from Buffalo, New York to Halifax, Nova Scotia, will air on the Velocity Channel on Saturday, November 17, at 7 a.m. Eastern time. The show will feature all city stops along the route and most vehicles in the event. It highlights all of the highs (from the top of Mount Washington in New Hampshire) to the lows (at sea level in Bar Harbor in the pouring rain). 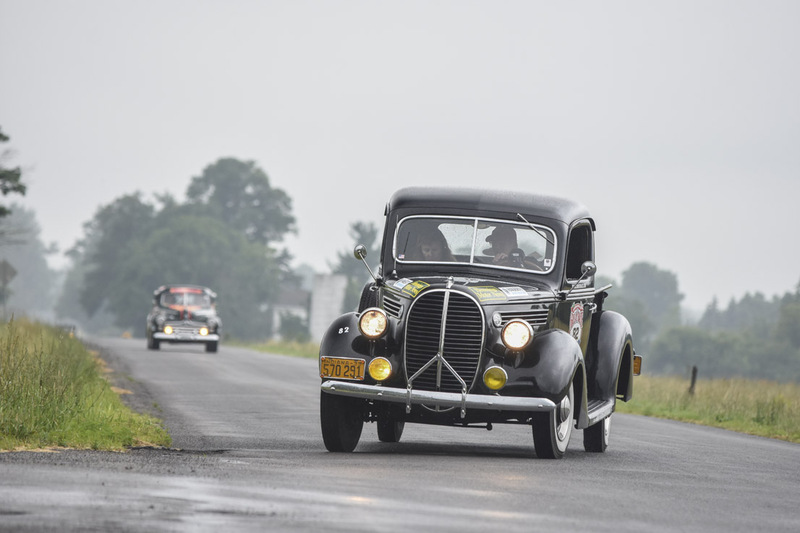 Of course the tight competition between three teams vying for the win the last two days is featured, including the overall winners Jeff and Eric Fredette in their 1933 Ford pickup truck flying the American flag. Velocity only has one broadcast time for its network, so it will be seen at 6 a.m. Central, 5 a.m. Mountain and 4 a.m. Pacific times. Be sure to set your DVRs and check your local listings or www.velocity.com for more details. I live in Lafayette Louisiana will the show air here cable company is Cox Cable. Will you have a copy of the broadcast? I have Velocity, however it’s not showing in my area. We are in one of the areas you visited (Rothesay,N.B) and would love to view the broadcast.